Sumi moon print 8×10 on Rives printmaking paper. I made this piece for my son, Gabriel, who is obsessed with the moon. Originally, I had planned on making it more detailed, but I really like the energy of this direct and simple execution. I am experimenting with this zen style of painting. The idea of the style is to empty your mind and let the energy of your spirit flow into the painting. For this piece, I thought I would start with this simple moon/sky. 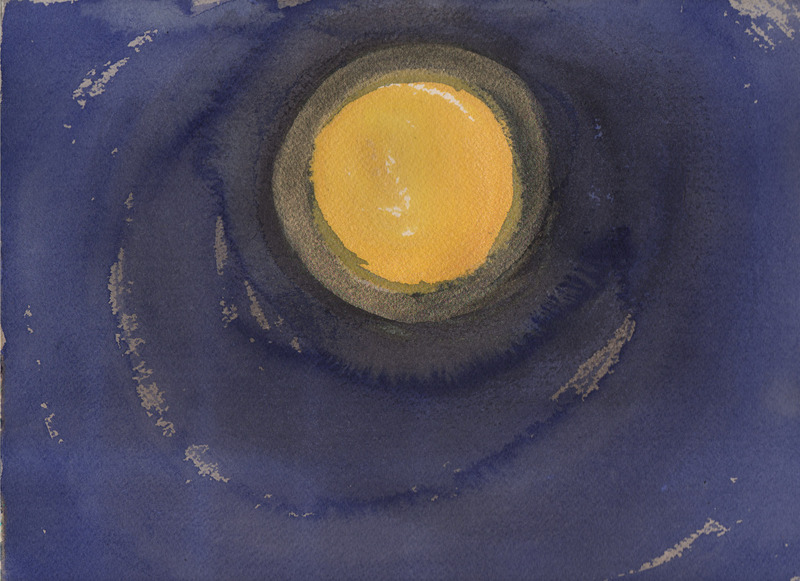 First I did it in black; a series of enso circles to define the moon and the surrounding sky, then broader with water, to create a wash. Then back in with gold for the moon and a halo, and then blue violet for the sky, using the same technique. For each stroke, I empty my mind, breath out, breath in and then execute the stroke on the exhale, driving the energy through my body and down my arm and into the painting with each stroke.